Chris Wilder has warned his Cobblers players that Carlisle United will ‘really go for it’ at Sixfields tonight (kick-off 7.45pm). 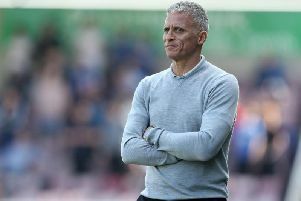 Keith Curle’s side head to Northampton buoyed by an impressive away record that has seen them dispose of some good teams already this season. Carlisle put QPR to the sword in the Capital One Cup tie at Loftus Road before losing to Liverpool on penalties at Anfield in the following round. They have won three times on the road in Sky Bet League Two, seeing off Hartlepool United, Leyton Orient and Stevenage. And Wilder knows seventh-placed Carlisle, who have scored 23 goals in 13 league matches this season, are unlikely to sit back at Sixfields. “They’ve changed the shape around, played three centre-halves and played a really open, attacking game,” said the Cobblers boss. “They really do go for wins on the road. “They’ve got a lot of good players on the ball who are mobile as well so they’re really dangerous opponents. “We will have to be alive to what they do tactically because they changed the shape (in the 1-0 win at home to Exeter City) on Saturday, playing 4-3-3. “They might come with three centre-halves tonight but they do make the game extremely big and try to pass and play through you. But with Cobblers also favouring attack over defence, does it suit them to take on a side who will not just come with a clean sheet in mind? “We’ve got to break down whatever’s being put in front of us, whether they’re a direct side, whether they pass it, whether they play counter-attacking football or whether they go for it,” Wilder said. “It’s up to us to be adapatable. “We’ve seen in the past couple of games - we had a Hartlepool team that sat back and we had to break them down. “Even last Saturday (in the 2-1 defeat at Cambridge United), we had enough of the ball at the back and they sat in when they went 2-0 up. “We have to sort out different problems and whether they sit in or come at us, we’ve got good players who can adapt to both. “If they sit in, we’ve got to move the ball about quickly and precisely with decent movement and if they want to come at us, we’ve got to be defensively right to absorb that. “We feel we can hit teams on the counter as well. “One of the things we’ve done really well this year is when we do break the play up in certain games, especially recently, at Morecambe and Wycombe, we’ve countered really well. And keeping clean sheets is one thing Wilder knows his side must start to do if they are to rise from their current position of ninth in league two. Town have not shut a team out since beating Oxford United 1-0 at Sixfields on September 12. And Wilder said: “We need to defend a bit better. “It’s been quite a while since we had a clean sheet so we need to get back to that, which we had a the start of the season. “We can’t leave ourselves a mountain to climb, which we did on Saturday, especially after the sending off (of Lawson D’Ath). Cobblers were beaten for the first time in seven matches on Saturday, as Cambridge United claimed the three points at the Abbey Stadium. And Wilder wants a reaction from his players tonight. He said: “It’s not a major issue - you lose games of football, it’s what happens. It’s about the reaction. “We didn’t lose if because of a lack of spirit or commitment and now we’re looking for a reaction and for us to go again. “We’re positive people, we believe what we’re doing is the right way and the club hasn’t had a start to the season like this for quite a while. “People keep telling me it’s usually after Christmas where the team kicks on so we’re in and amongst it. “A win would have shot us right up the league because there were more strange results at the weekend, but it’s important that you don’t go one loss, two losses, three losses. “You have to quickly reverse it and that’s what we’ll be looking to do. “But we’ve got decent opponents in front of us yet again. “Keith’s pulled together some good players, they’ve changed the style and they’re very adaptable. “It’s another challenge for us and you look at the league - there’s a lot of teams who do well away from home.